Like Us and you will receive special promo's only available to you! Please Contact Us with any questions or comments. 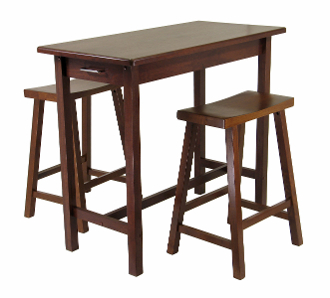 Table size is 39.37"W x 19.69"D x 33.27"H. 2 Drawers with inside dim 11.34"W x 13.19"D x 3.54"H.
Include 2 Saddle Seat Stools size is at 17.48"W x 14.47"D x 24"H. Seat dim is 17.48". x 9"D.
Made with combination of solid and composite wood in walnut finish. Assembly required. Copyright © 2012-2019 Kitchen Wine and Home. All rights reserved.